The RJB11S Control Stations are designed to withstand the harshest environmental conditions. The RJB housing is made of extra-hard temper marine-grade light alloy (Stainless Steel 316 also available). The external and internal coating is suitable for outdoor permanent exposure to weather, salt, acids and UV radiation in extended temperature range and reduces the possibility of formation of condensate. The RJB11S Control Stations offer quality, durability and reliability in all conditions. Stable and robust mounting base with 4 external fixing points. RJB11S1500 isolator and selector switches up to 4p 32A 11kW AC3. Feature padlockable handle, cable entries in the bottom side or top-bottom. Mounting base with 4 fixing points. External equipotential bonding connection facility for 4-6 mm2 wire. RJB11S2001 Emergency Stop. The robust external operator can be removed only with a special tool and can withstand shocks, impacts and vibrations as required by IEC60947-5-5. Latching operator, twist-to-release. Key release, locking and guard options available. RJB11S2008 Key Switch and RJB11S2009, RJB11S2010 Selector Switches. Available in a variety of configurations: 0-1, 1-2, 1-0-2, 1-2-3, AUTO-MAN, FWD-OFF-REV etc. Up to 2 separate contacts available in each position. 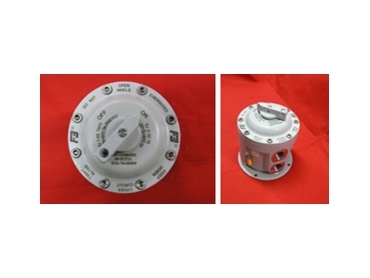 Choice of silver 690Vac or gold quad-connect low voltage contacts. Other versions and customizations available, please inquire. Most of our products are customized to specific requirements. Also available: RJB11WL 2500 Lumens PowerLED spot lights. Operating voltages: 12Vdc, 24Vdc, 36Vdc, 48Vdc, 60Vdc, 72Vdc and 240 Vac. The RJB11S Control Stations arwe available from Flameproof Engineering .